The Alien 220 Mod from Smok is a widely popular device, largely due to an array of features, lots of power, and the slightly quirky (and much improved over the X Cube) side firing button. 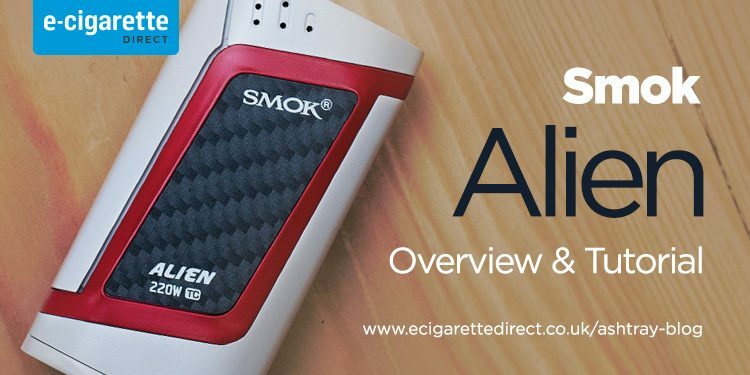 In this tutorial we’ll cover key Smok Alien features, how to use it and what we like and dislike about the device. The first thing you’ll notice about the Alien is probably the weight. It’s a heavy thing, but then that brings with it the feeling of sturdiness. Despite being rather a lump, it does fit nicely into the hand. Okay, maybe what you’ll actually notice first is the shape. Although it is very much like other boxes in its boxiness (that’s a real word! ), it does have rather a pleasing roundness to the sides. This makes it a lot more comfortable to hold than many similar devices on the market. Next thing you’ll likely notice is the large OLED screen. It’s slightly overwhelming at first, as it packs in a lot of information. But once you’ve sussed out what everything means (it is all labelled well), you can tell the vast majority of any information you might need at a glance. Having the usual spring loaded 510 connector, up and down adjustment buttons on the face (oddly down is higher than up due to the parallelogram design on the front and back), and the firm side firing button, you won’t find the Smok Alien difficult to run. 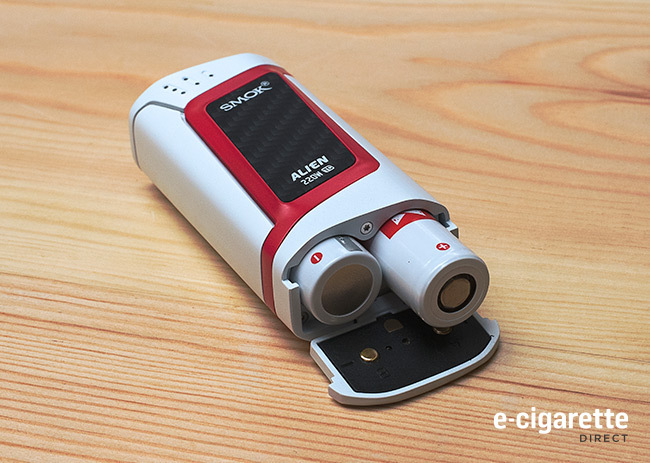 View the Smok Alien on ECigaretteDirect. Firstly slide off the battery door on the base of the Smok Alien, then insert as indicated on the inside of the door, and inside the device itself. (i.e. Insert the first battery positive first, the second battery negative first). Then press the side firing button 5 times in quick succession to turn on. Attach your tank/atomiser, and the display will ask if it is a new coil. If you’re returning the same tank/coil to the device click the down button indicating N for no. If it’s a different tank, or you’ve changed coil, select the down button indicating Y for yes. Once you’ve installed the tank on the device, simply adjust the wattage or temperature to suit. Pressing the power button and down together momentarily will access the mode selection, allowing you to choose between wattage, temperature and memory mode. Click the power button five times to lock, then hold for 5 seconds to fully switch off. All settings will remain intact when turned back on. Clicking the power button 3 times will access the more in-depth menus for mode, puffs, settings and power on/off. The up and down buttons scroll between the further options (or a single press of the power button), then if you hold the power button it will select the highlighted option. I’ll skip the power off option, as that speaks for itself. Mode: The first selection you can make in the mode category is either watt/temp/memory. As an example I shall run through setting up a stainless steel coil in temp mode. First, click the power button three times to access the main menu. Then hold it down for a second to select the mode, where you select temp from the temp/watt/memory options. Next you can select wattage strength, setting this higher means you will hit the max temp set faster. On the next menu you can choose the material of your coil, SS/NI/TI being the options, then on the final screen you can adjust the coefficient of resistance. Differently rated materials heat and change resistance slightly differently, so this option allows you to adjust settings to suit the particular type of coil you have. Puffs: This is your puff counter/limiter option, with a slightly less confusing two layers of options. First you can limit your daily puffs up to a max of 999, or simply not count them by selecting ‘Never’. After that you have the option to reset the puff counter, with a simple Y/N selection. Settings: This section deals with screen settings, manual Ohms adjustment and firmware upgrading. First, click the power button three times to access the main menu, then scroll to select the Settings menu, then take the following steps for each sub menu. Scr Time: The first sub menu allows you to switch Stealth Mode on or off, selecting Y/N as appropriate. After this you have the screen timer, selecting between 15-240 secs of time before the screen goes black. Scr Lock: Here you are given the option to select Y/N, allowing you to auto lock the device as the screen goes off. Contrast: Naturally enough, adjusts the brightness of the screen. Simply select from 10 (dim) to 100 (bright). 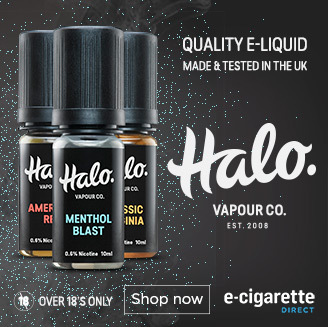 Manual Ohms Adjustment: This is one that has puzzled us at Ecigarettedirect, owing to the fact that Smok hasn’t seen fit to tell anyone what the aim of this function is… What it seems to be, is a way of adjusting the resistance of a stainless coil (which can be used in wattage or temp modes), when it is warm, so that the device fires it correctly once put into temp mode. If the base resistance is known to be 0.257 Ohms (as mine is), you’ve vaped in wattage, unscrewed the tank, placed it back on and select “New coil? Y”, your resistance now shows higher due to having been heated. You can then adjust it back to the original resistance rating, so that the device will give you an accurate temperature when fired in temp mode. In testing, I have found that the scope of the adjustment is fairly limited. Having screwed the tank back on, with the resistance reading at over 0.3 Ohms, I couldn’t adjust low enough to give a true reading. As such I feel that it’s rather a redundant feature. In fact, if you allow your coil to cool for several minutes before screwing it back on, the Alien will read the correct resistance without you having to go through the settings. Finally within the settings menus you have download, which allows you to update your firmware via your PC/Laptop. To upgrade your Firmware, you will need visit Smoktech.com. This link will take you to the list of downloadable firmwares. Make sure you select the right version. Once you get the correct version you’ll find both the download and the full instructions. Sorry Mac users, the Smok Alien upgrade link currently only works on PCs. Upgradeable firmware, so when Smok improves features, so can you. My alien is harsh and doesn’t give that much smoke. Then I see other people with Vapes hitting it for much less time, not choking, and getting way more smoke. Can you please tell me what to do? Thank you. May I ask what are the side effects, Broncitis? Any others? Hey Alan, the Smok 220 is just a mod, it’s not actually a tank. So the coils will depend on what tank you will use it. The Smok 220 should be compatible with most tank devices, but given the power it can put through it is best used with a tank that takes low resistance coils. Hiya, ive got a smok alien 220w it was on charge (50%) and it was knocked off the table, only a foot high, and when I picked it up it up, it was off. Ever since then it won’t power back on, any body got any suggestions PLEASE, I don’t want to go back to smoking fags! !